The colours are brilliant, but MAN is there ever still a vinegary smell hanging around the yarn…I might have to give it another rinse and shampoo before being able to knit it up. Hmm. AT least Kool Aid gives you a nice fruity smell! And with that, back to Monday I go. May your knitting not be far away! 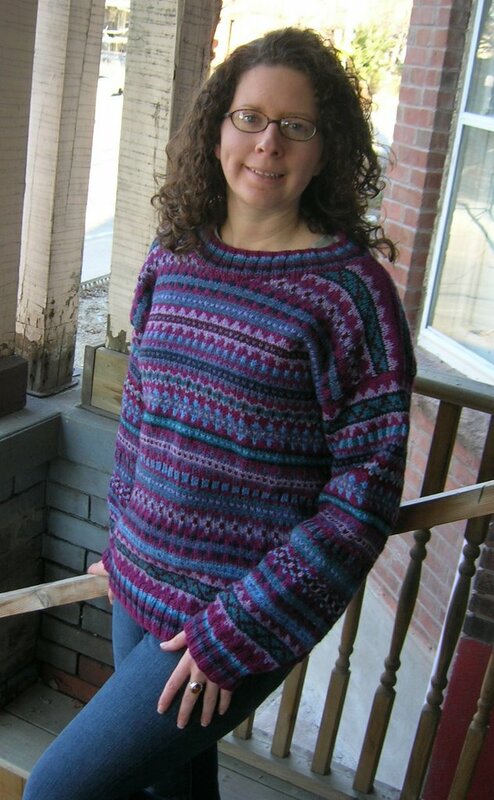 That is one Beautiful FI Sweater! Seriously stunning…and the colours are great for you, and btw, you look just fine..morning fog and all. Those are some very cheery koolaid socks! If those couldn’t break a person out of the late winter doldrums (coming up, we all know) I don’t know what could. 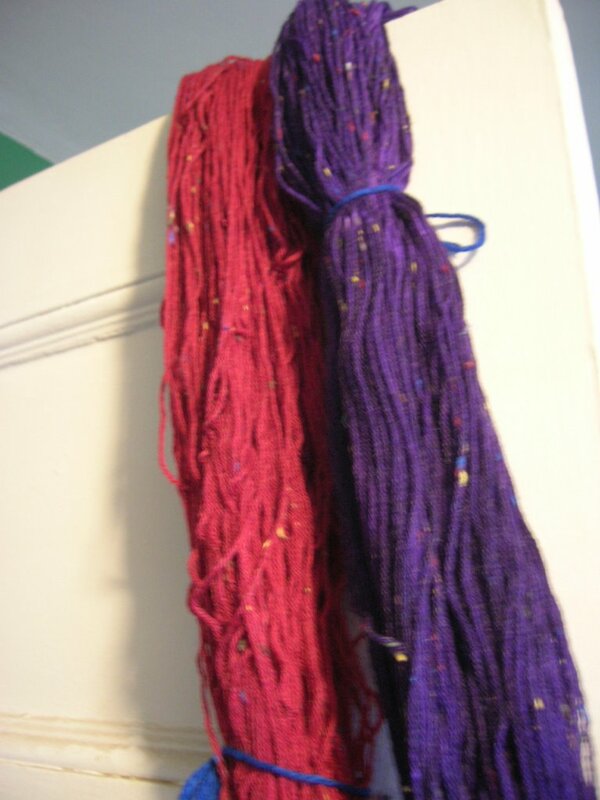 I’ve heard about that vinegary smell, not a favourite of mine…but the yarn looks fabulous…may just have to stick with the fruity koolaid (athough I found it to be a bit overpowering also). Gorgeous sweater! The colors are perfect for you. Wow, that sweater is one serious piece of work! Bravo. It looks like a nice comfy fit too. I am in awe! Beautiful work! Oh wow! 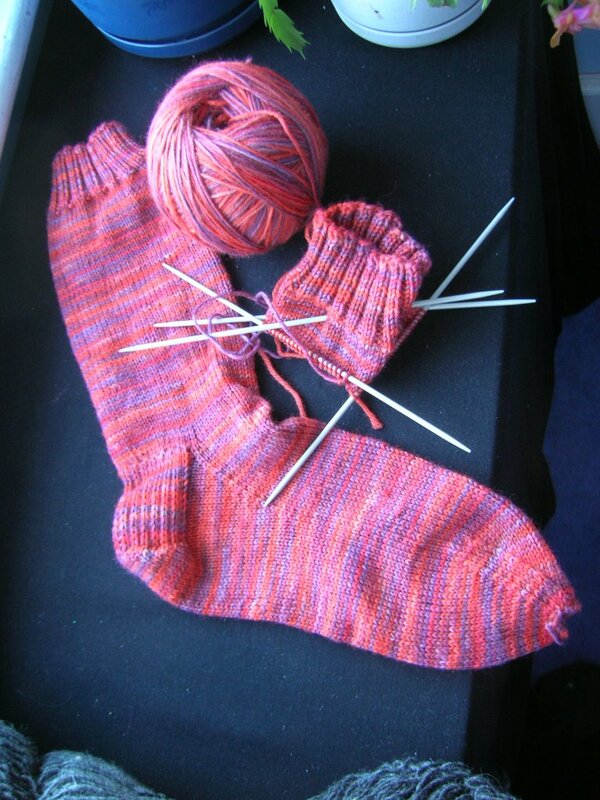 that is beautiful.I ogle Philosopher’s site but I don’t think I could ever make my mind up which colourway. Really love that Fair Isle Sweater, looks great on, excuse me for being dumb but what is M I A? Doh, have just realised what MIA is, thought you had been struck down with something nasty…still laughter is the best medicine!! Holy cow! That sweater is gorgeous! And so are those Koolaid socks. I might try dying some time but I am sooo not going to ever do fair isle. I’m convinced I’ll go blind. But you did a splendid job. I’ve come here from your Ivy pattern at Knitty. I’m planning to make it! And once I saw you’re Canadian, I just couldn’t resist it (I’m north of Toronto…off towards Phil. Wools a bit). I have done a little Kool Aid dyeing, and recently attended a workshop using Wilton cake decorating dyes to dye yarn. So many colours, and no ordour. Why does Christmas have to happen now, when I have all the ideas and no time? Gorgeous! Both you and the sweater of course. I’m in such awe of how prolific a knitter you are! How do you manage it? I always find I’m just too knackered to do much in the evenings which leaves me my train journeys into work to get anything done. But you! I salute you and your amazing sweater!